Our customers at Pennant Hills Marketplace will be greeted with a splash of colour all thanks to our newly painted community mural. With collaboration with Pennant Hills War Memorial Children’s Centre a community based pre-school that has been a part of our local community for over 70 years. 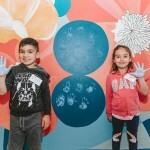 Over the course of 4 days we had a total of 114 children paint their handprints on the mural that was painted by a local artist. The project brought together the centre management team, retailers and the wider community and will be on display for our customers to enjoy for the years to come.